75 and 200 gpm in-line hydraulic testers. Accurately measure oil flow, pressure and temperature on in-plant equipment, forklifts,machine tools and more. Temperature and flow readings are in Metric and English, accurate to within ±2% of full scale. 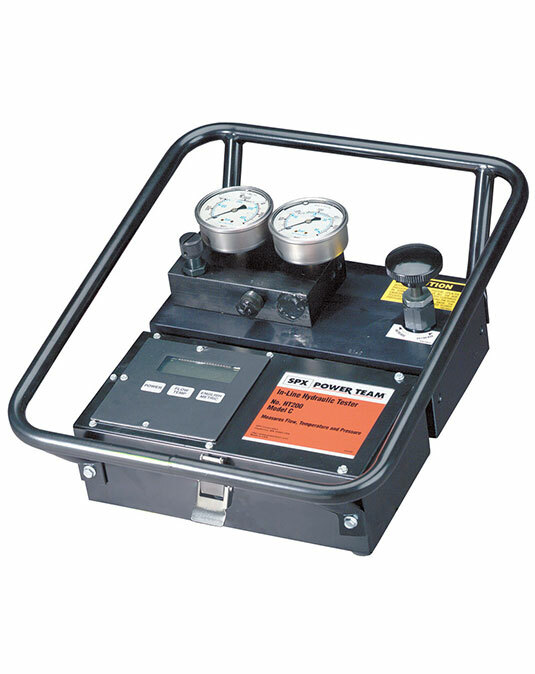 Dual pressure gauges for high and low pressure readings; low pressure gauge is automatically shut off and protected as pressure rises beyond its maximum reading. Automatic pressure compensating feature lets you increase flow without affecting pressure setting. Reverse flow through tester will not cause damage; replaceable safety disc ruptures if pressure exceeds upper limit. Solid state voltage regulator eliminates errors caused by voltage change during testing.